Sometimes you find the best stories close to home. Cairn Cartographics is a map-making company based out of Missoula Montana. It also happened to be founded by my cousin Amelia Hagen-Dillon and her partner Jamie Robertson. I was a supporter of a Kickstarter they ran a while ago, and have been watching in awe as they've cranked out map after map over the last few years (they just published their sixth map released a poster of the Bob Marshall Wilderness too), while also posting some amazing photos on the Cairn Carto Instagram. Each year they spend months hiking and collecting data, and then spend the winter making these incredibly detailed, and easy-to-use, maps that have gained something of a cult following out west. Yes, it's pretty much a dream job for many , but, it also requires with no small amount of hustle. I did a little Q&A with Amelia to find out just what goes into to making maps in 2015. H&E: Tell us about your path into cartography? What attracted you to making maps? Tell us about Cairn Carto. I’ve loved maps and geography since I was in Elementary school but my path to making the type of maps I make now started in college. I was an Environmental Science major and my favorite classes were GIS classes where I got to study and analyze things spatially and on a landscape level. In college I was also active in the Outing Club and realized that access to wild places and outdoor recreation is something that I need in my daily life. My last two summers in college I worked for a non-profit in the Greater Yellowstone area doing fieldwork for several landscape-level research projects. I fell in love with the Northern Rockies and met Jamie, who is my life/business partner now. After my first summer in Yellowstone I did a semester with the National Outdoor Leadership School in Patagonia where I spent a lot of time traveling on networks of old cowboy trails that were historically used to move livestock between summer and winter pasture. The maps we used in Patagonia were old and crude and most didn’t have any trails on them so I thought it would be a fun project to go back there and map them and put together a cultural history of the region. Jamie and I applied for a grant for that project which we didn’t get but we had spent a lot of time figuring out how to make the maps we were envisioning so we decided to start a little closer to home with a map of the Bob Marshall where Jamie spent a few summers on a trail crew. Our first summer (2010) the two of us plus Jamie’s brother Thomas hiked and GPS-ed about 700 miles of trail. We spent the winter working part time and spending our spare time putting all that data together into a beautiful and accurate map. We printed the map the following spring and started fieldwork for the next map. We’re now in the midst of our sixth repetition of this cycle and still tweaking the process but the seasonal rhythm, which I love, has remained constant. H&E: Can you describe the process of making a map? You guys go into the field with GPS’s and actually gather data first right? We start by spending a few months getting to know the area. That means a lot of studying existing maps and Google Earth and talking to people who have spent time hiking or working there. Once the snow melts we are in the field four or five days a week hiking, running, backpacking and sometimes just driving to get to know an area. We GPS trails and we take notes on road conditions, trailhead amenities, campgrounds, and any other information we think might be useful later on. When it gets too cold to hike we switch to office mode and track down all the data we can find for the area. This means roads, trails, land ownership, geographic names, hydrography (rivers, streams, and lakes) and more. All of the data for making a map like ours is out there in the public domain- from the USGS and the forest service and some other places but I feel much better about making maps for people to explore wild places if I am familiar with the place. Cartography involves thousands of tiny decisions about what to emphasize and what is ok to cover up and it’s much easier to make those decisions if I know the area intimately. H&E: How long does it take to produce a map? It takes us about a year. It is definitely possible to do it faster but I really enjoy the process of getting to know an area really well. Bigger cartography firms will gather all the data, crop it, and use an algorithm to style and label all the features and then outsource the fine tuning (cleaning up overlapping labels etc) to places overseas with cheaper labor costs but I think you lose some of the soul that way. The fact that we know the places we produce maps of so well is reflected in the final product. H&E: What about printing? I know finding a quality printer is a challenge. What is involved in printing a map. Our maps are incredibly complex documents with a lot of really tiny details like really small fonts and contours and very fine lines so a high quality print job is really important for the map to be legible. We print on an offset press which means there are four color plates- cyan, magenta, yellow, and black (CMYK) and then additional plates for spot colors that get made out from our digital documents and loaded into this huge press. Each piece of paper gets run through the press and basically stamped by each plate and it comes out looking like a map. It’s a really cool process but unfortunately there aren’t many big offset presses left working in the US and the people who are really good at working with them are mostly older or retired. It can take a lot of fine tuning to get the plates lined up perfectly and to get the colors even across the entire sheet and the correct shade. We’re currently working with a press in Denver that we have been really happy with but there was a learning curve on our end and on their end to figure out how to make the map look the way we wanted it to. H&E: Also the maps themselves are not standard paper right? 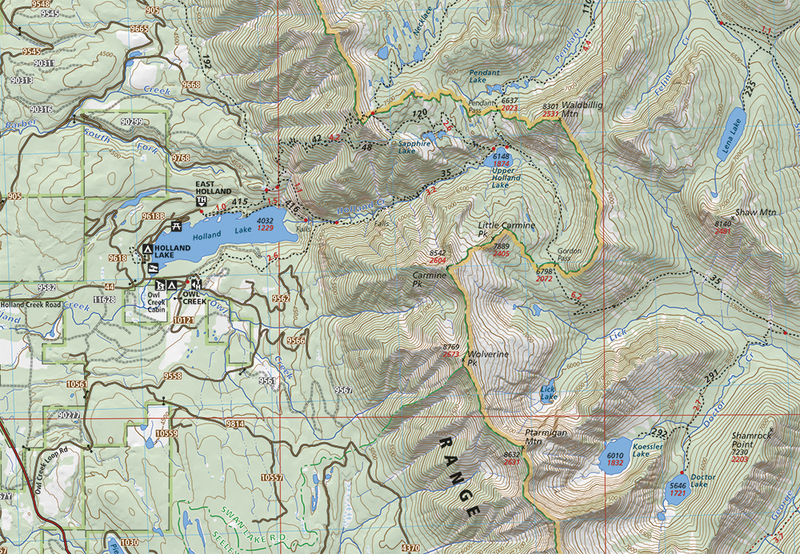 Yeah, our recreation maps are printed on waterproof plastic which is pretty standard for outdoor recreation maps now. It is a lot more expensive than paper but it is much more durable and you don’t have to worry about it getting soggy or crinkled in your pack. It can be tricky in the press because can stretch during the printing process which can mess up registration and it also has a slight yellow tint that affects how colors look but we have learned to compensate for that. Our newest map is a poster of the Bob Marshall which is printed on a heavier stock which was a whole new learning process but I think it came out really well. H&E: What makes a Cairn Carto map unique? Can you discuss your approach to designing? I’m definitely not unique in calling myself a map lover- the reaction I get most often when I tell people I’m a cartographer is “sweet! I love maps!” There’s been some fascinating research from neuroscientists about how we move through space- basically we are all constantly drawing maps in our brains so we can refer back to them later and find our way home. Maps are an expression of what is going on in our brains which I think is why everyone loves them so much, they just make sense. I think about those internal maps all the time when I’m working on a map. My goal with design is to make a map that feels intuitive, I don’t want the viewer to have to refer to the legend over and over to figure out what they are looking at. I want the design to be clean and not feel cluttered but I also want to fit as much information as possible. We use a combination of shaded relief and contours to make the topography easy to understand. We use a color palette that reflects the landscape- our maps of the Northern Rockies are predominantly green with blue, gray and brown. I want to give people that “ah ha” feeling when they look at a map and see how pieces of a landscape fit together. H&E: Maybe some people think maps aren’t needed anymore because of GPS or iPhones or whatever, but obviously maps are critical. Is this something you guys think about? I get asked all the time why I make paper maps in the age of GPS and smart phones so I have spent a lot of time thinking about that! I see maps and GPS as complementary tools. I use both daily! Maps are irreplaceable for planning. Anyone who has ever tried to plan a long distance road trip on an iPhone can relate- nothing compares to spreading out on the floor with a stack of maps to get a sense of the big picture. For safety reasons it’s important to have a sense of the bigger picture if you are headed into the backcountry but it also makes your trip more fun and interesting. Print is a much higher resolution than digital and misplaced labels or awkward line widths stick out much more when you look at a map as a whole and not just a little piece at a time. It takes a lot of time and skill to fit data from all different sources together and make it look good. Cartographers spend hours agonizing over font sizes, label placement and color choices. In our case we spend weeks on the ground to GPS the trails as well. We know what the trail along a particular creek feels like underfoot. We know how the trail is just far enough from the creek that the creek’s name can be squeezed in between them on the map. We know the landscapes that our maps cover and we know our maps themselves intimately and you need the tactile quality of a printed map to reflect that. H&E: What comes next? Are there certain areas you’d like to map in the future?